Born and raised in South Louisiana, The Crawfish Man (Greg Drouin) moved to Houston in the early 90’s. Greg stumbled into his passion by chance. It all started out as an annual crawfish boil that he put on for family and friends. As far back as he can remember, he was always out back playing in the swamps in his child hood home out in Bunkie, Louisiana. Greg shared stories from his childhood with all his family friends. From the time that he was just a toddler and Mr. Moose LaComb snatched Greg up by his hair down at Holly beach to escape the jaws of a very hungry Alligator, to setting his very first crawfish traps at the age of 7 with his Mami and Papi under the Bayou Lack bridge. He shared a passion of hunting, crabbing, and setting up traps for nutria rats and crawfish with his Daddy. Greg was destined to bring a little bit of Louisiana to wherever he goes. Word spread quickly through out our family and community, and pretty soon the demand for that good ole Louisiana Crawfish was knocking at the door. We started with just a couple pots and boiling a couple sacks at a time. But over the years we have grown, we now have 3 Crawfish trailers that we take on site. Our crawfish is always fresh and brought in from Southern Louisiana for all of our catering events. We can cater any event in the great state of Texas and we are equipped to cater anything from 150lbs - 10,000 lbs. 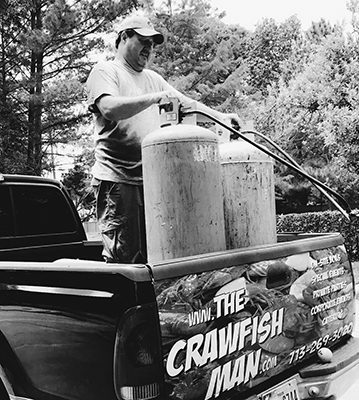 Our biggest rig can boil up to 3,500 lbs of crawfish at a time. We have participated in the annual Crawfish Festival located in Old Town Spring, and have boiled for corporations such as Briggs, Nasa, Hartwell, Harley Davidson, and Olin to name a few. We pride ourselves on serving an Authentic Louisiana taste, our recipe has been passed down from generation to generation. When we started catering crawfish back 2004/2005, we hit the ground running and have been non stop ever since. With the majority of our clientele stemming from our corporate boils, we were always asked where home base was for us. So after 13 + years we are bringing our very first brick and mortar located in the heart of Missouri City. We are nestled right in the middle of Quail Valley. 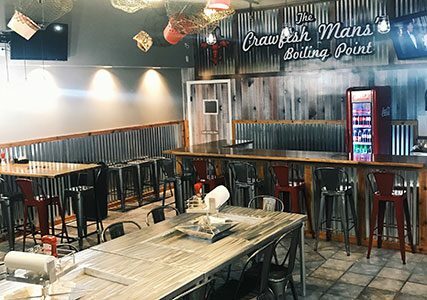 Our goal was to have a place where you can come enjoy some good authentic cajun food with your family and friends. With crawfish being a seasonal item on our menu, we will have other items available year round. So please come out and join us for some good eatin down at The Crawfishmans Boiling Point.